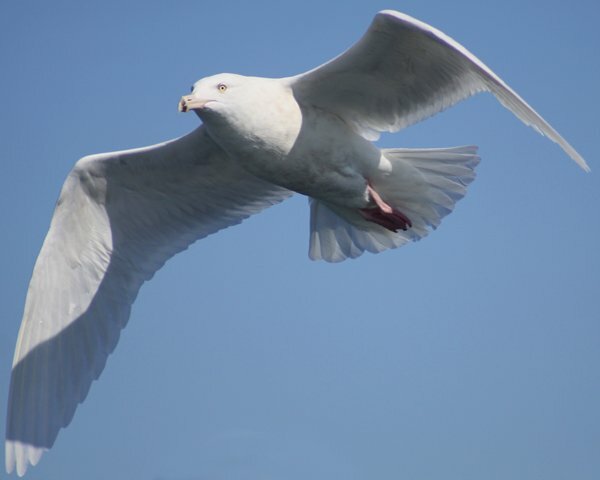 A big bruiser of a bird, the Glaucous Gull is nothing if not bulky. It sometimes looks like a gull built from a child’s blocks, with its square-headed appearance and barrel-chested brawn. 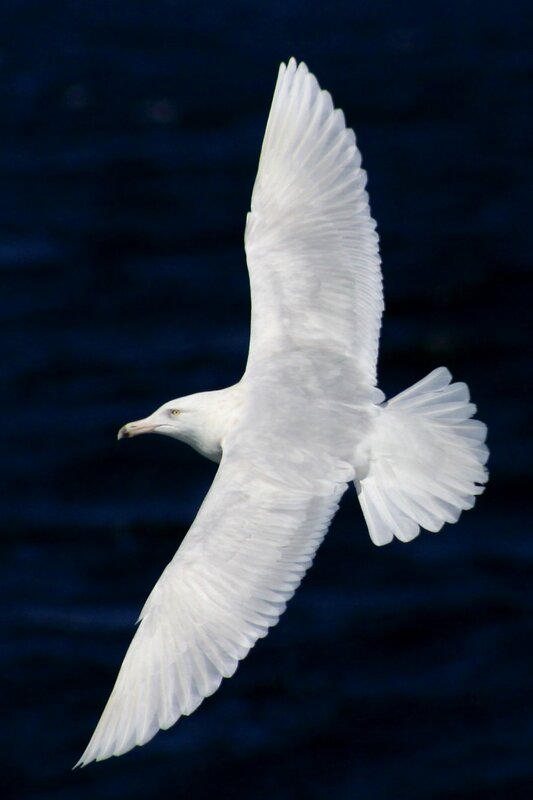 But when Larus hyperboreus is viewed from the back of a boat as it fights for position in a chum line it transcends its simple shape and becomes a thing of beauty. Maybe I am getting too sentimental but when that big a bird, almost entirely white, is seen from the top deck of the boat with the dark blue sea as a back drop, like in the image at left, it can take your breath away. Don’t you agree? It is certainly odd that a bird that has been described as a “massive beast…capable of swallowing a European starling in one gulp” could seem so graceful out at sea but there it is, soaring on the ocean breeze and scaring off smaller birds without seeming to expend much effort at all. 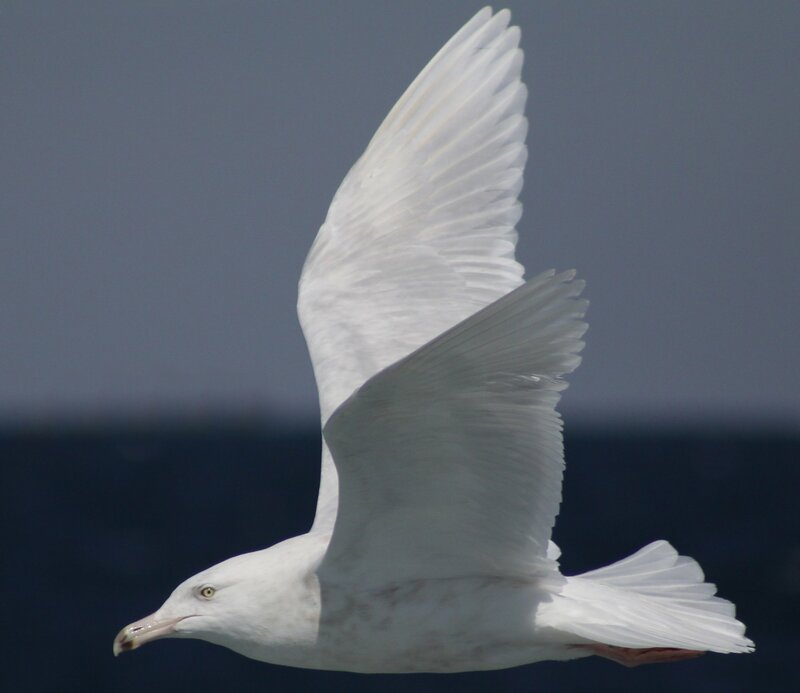 Glaucous Gulls, as only makes sense considering their scientific name, nest in the high Arctic. 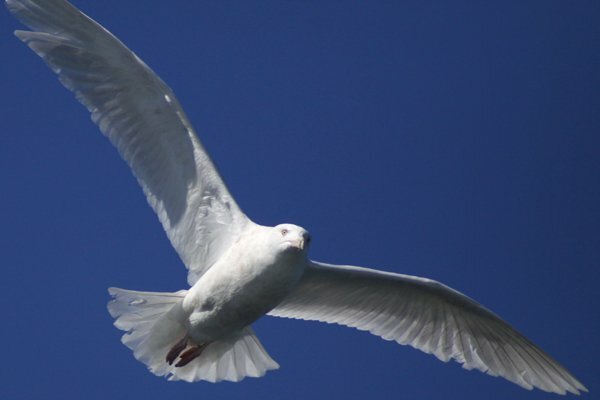 Larus hyperboreus only make their way south in the winter months, delighting birders whenever they are sighted. 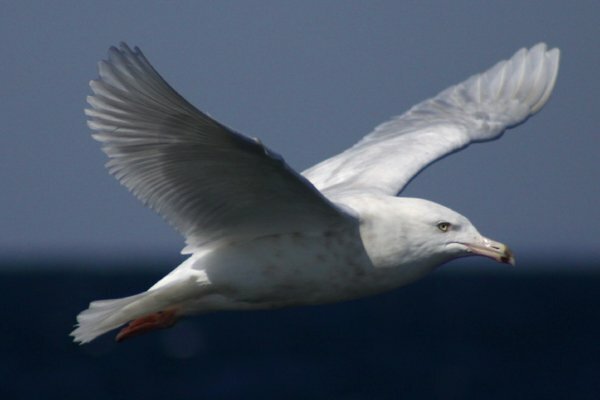 Interestingly, according to BirdLife International, which lists the Glaucous Gull as a Species of Least Concern because of its large range and population, the populations found in the western Palearctic tend to remain near nesting grounds year-round so it is essentially only the North American breeders that wander during the winter months. Of course, when this particular second winter bird was flying around in front of me in bright sunlight I wasn’t thinking about any of that but I was thinking about the difficulty inherent in photographing a bright white bird in the sun. I think I did alright though, and I hope you agree. 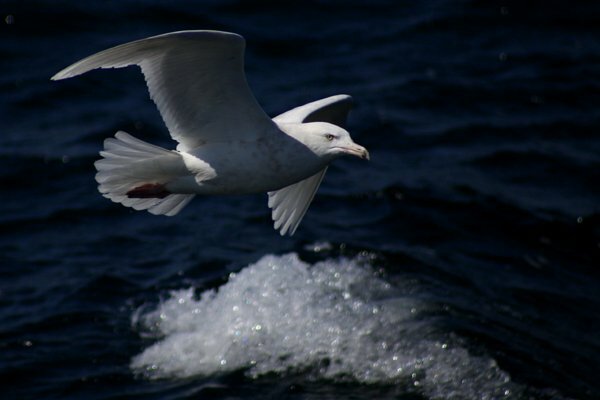 Enjoy these shots of the big white gull of the far north and here’s hoping you get to see your own soon enough. The first four can be made bigger by clicking them so make sure to try that as I think checking out these pictures in a larger version is well worth it. I hope you enjoyed these shots because I definitely enjoyed seeing this absolutely gorgeous bird and photographing it like a madman! But before you go, as an added bonus here is one of the three videos I shot of the Glaucous Gull. Pretty darn cool, no? 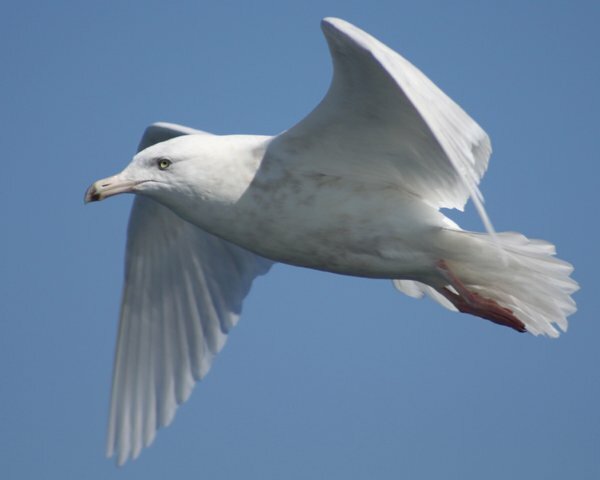 Now get out there and find your own Glaucous Gull! My only one was a second winter bird in the Farallon Islands in California. Pretty good spot by my boss on an island with tens of thousands of Western Gulls. Okay, I’ll look for one or several hundred. Should see them about the second week in May. Beautiful shots of a very pretty bird. They are very interesting to observe and study. This looks like a big bird. Very interesting in this almost totally white plumage. Thanks for sharing. I think gulls of any type are not fully appreciated. They are grand flyers and worth watching. Great series!! Boom & Gary of the Vermilon River, Canada. Your consummate post begs the question…which is more fun, Bird photography or fishing? It is easy to understand your affection for a creature that calls the realms of ocean and sky its playground. Certainly your pictures evoke the classic images of angel wings. 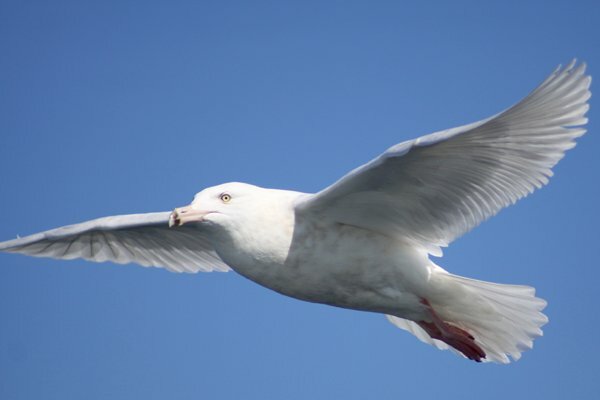 There is hardly a bird photographer that doesn’t have reams of gull shots and for good reason. 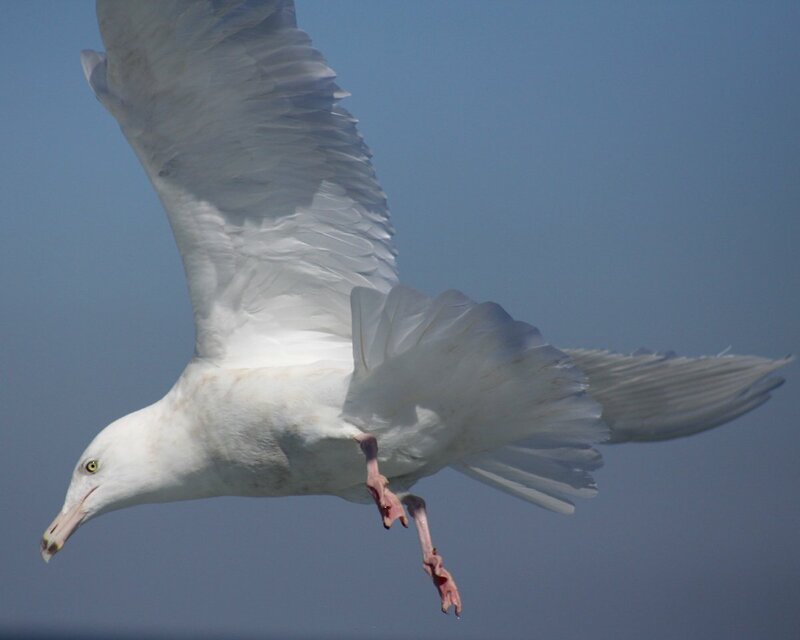 Giving in to the urge to anthropomorphize the Glaucous gulls solemn countenance and stoic nature makes for ready comparisons with human nature. Given their lack of fear for the lens, wonderful chances are a given but as you say the challenge becomes finding a perfect exposure. Not easy. When you get that shot of the gull eating a starling in a single gulp, well, please post! Really a great set of action images. Well done. White-winged Gulls are amazing. That is all. Wonderful set of photos! You did an amazing job shooting this bird. Lovely images of a beautiful bird. Hi Corey–this is a great looking series of photos and I enjoyed the video too! I lived at Sea Gate in Brooklyn for a about 5 yrs saw all sorts of cool gulls there! Terrific flight images, Corey! I particularly like the first and the fourth one with the wings spread like a cape. 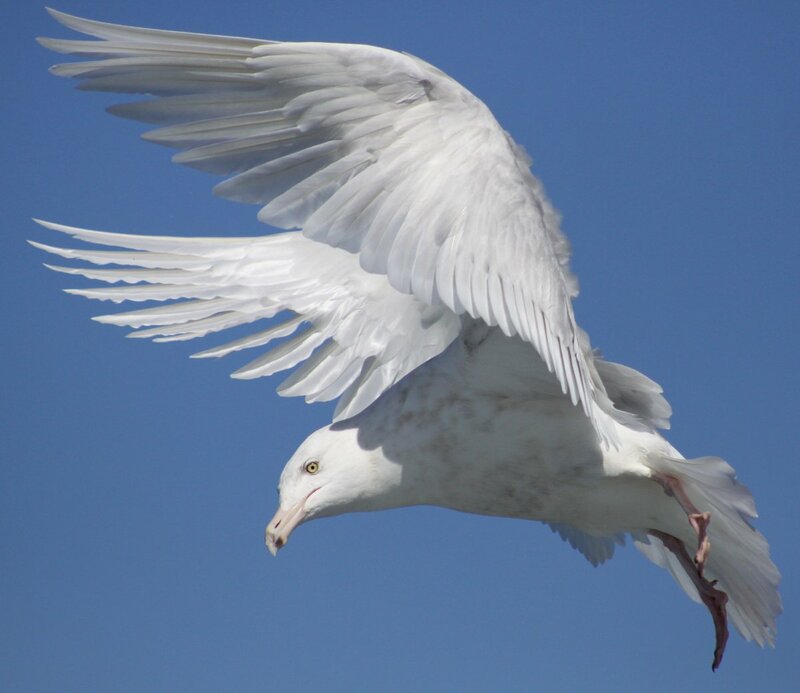 It’s a beautiful gull! Gorgeous gulls, and WHO says you can’t sell gull shots! These would prove that addage wrong.